1982 was a year that marked a lot of changes for us. Tim graduated from Friends University in Wichita with a BA in Business Administration. We were so excited. We thought once he got that degree, our financial situation would improve. He would land a job with a great starting salary, and we would be on our way. Things didn't work out quite the way we planned, however. The country was in a recession. Jobs were scarce, especially jobs for new college grads. Tim had been working part-time as a computer programmer during his last year of college. The company he worked for was a small, family-owned electronics firm. They offered him a full-time position, but the pay was peanuts. Let's just put it this way. I was teaching in the Wichita Public Schools. I had little experience, being that I had graduated from college only 3 years before, yet my salary was almost twice what Tim was offered. We were so disappointed, but Tim took the job. At least he had one, and we were optimistic that things would improve. Oh, how we wanted to be home-owners! We felt like we would be foolish to continue renting. We wanted to invest in a home of our own. There were just two obstacles. 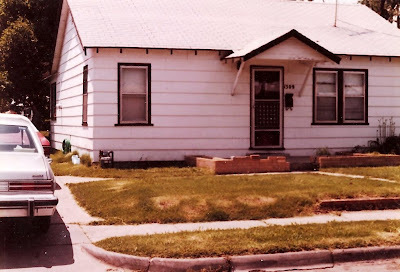 We had no money for a down payment, and the interest rate for home mortgages was 21%! We were undeterred. We found a house for sale which had an assumable VA loan. The interest rate was 8.5%. Tim talked with his dad, who was on the board of a bank in Liberal, Kansas, Tim's hometown. The bank agreed to give us a loan for $5000. We used that for the down payment on the first home of our very own. The house was 800 square feet. It had two bedrooms and one bathroom. Most of the house had gold shag carpet. The kitchen had a busy wallpaper and a busy kitchen carpet, all in shades of green. The outside needed paint. The brick flower-bed border around the front porch was crumbling. We couldn't wait to get started working on it. Due to time constraints, we had to go ahead and move in. Then we got to work. We lovingly painted the gold walls a creamy neutral color. Our next move was to look for some carpet. The rooms were tiny. We figured some carpet remnants at bargain prices would be the solution. Something happened before we could buy carpet. Tim's company cut him back to 4 days a week. That was the first clue that the business was in trouble. In fact, several months later, after not getting paid for two weeks because the company couldn't meet payroll, Tim went to work one morning, and the doors were padlocked. The company had gone bankrupt. When Tim was cut back to 4 days a week, our remodeling/decorating plans came to a halt. Now, we were just trying to get by. My dear mother came to visit. She painted the kitchen wallpaper. She helped me shampoo the carpet. We used what we had and made the house look the best we could. Tim's mother gave us a beautiful, antique bedroom suite. But, we had to live with that gold shag carpet. I hated it. When Christmas time came around, we wanted to have a tree so badly in our new-to-us home. If you read my post about our first Christmas together the previous year, we did not get to have one that year. We talked it over and decided we could spend $5 on a tree. Off we went to the Christmas tree lot. We began looking around the lot at the beautiful trees in various sizes and shapes. It didn't take long to realize that $5 was not going to buy one of those trees. Now, Tim is not the kind of person to let a challenge defeat him. He talked to the attendant at the lot and told him we had $5. Would they have any kind of tree they could sell us for $5? The kindly man led us to the rear of the lot. There he pointed out a small misshapen tree. We could have it for $5. We were overjoyed. We set it up on a chest in our living room. We were able to come up with a strand or two of lights. Tim's mother gave us a box of wooden ornaments (many of which we cherish to this day). We hung strands of icicles carefully, one at a time. It turned out to be a beautiful tree. We don't have any pictures of it. I'm not sure we even owned a camera that year. But, in our memories it will always be one of the most beautiful Christmas trees we've ever had. It was our first tree in the first house we owned. Through the years, we've referred to it fondly as our Charlie Brown Christmas tree. Oh, we've had all kinds of trees through the years. Trees that were far fancier. 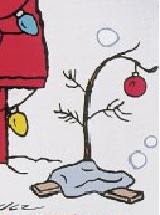 But our Charlie Brown Christmas tree holds a special place in our hearts. It reminds us of a time when we were young and struggling to make ends meet. When we lived in a tiny house with gold shag carpet. When our lives were ahead of us. In my mind's eye, I can see it now, the colored light twinkling. I don't need a picture.